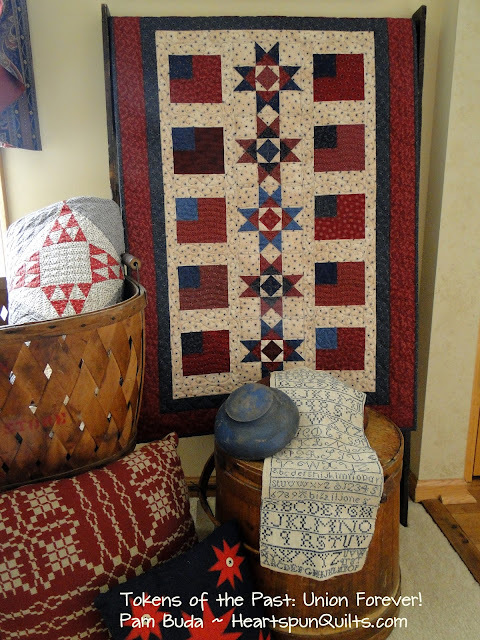 My hubby and I will be traveling to New England tomorrow for the Augusta, Maine Quilt Show! I'm so jazzed about returning to Maine because there's just something so special about New England. I'll be teaching four workshops and giving a lecture through Sunday, and spending time with fellow quilters is one of my favorite things to do. For my hubby, he will be hunting lobsters. 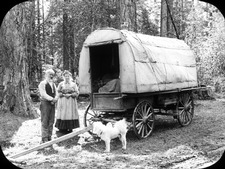 Monday, we will head over to Vermont for a few days of exploration and vacation. I can hardly wait!! Watch for another Scrap Give-away coming soon!! 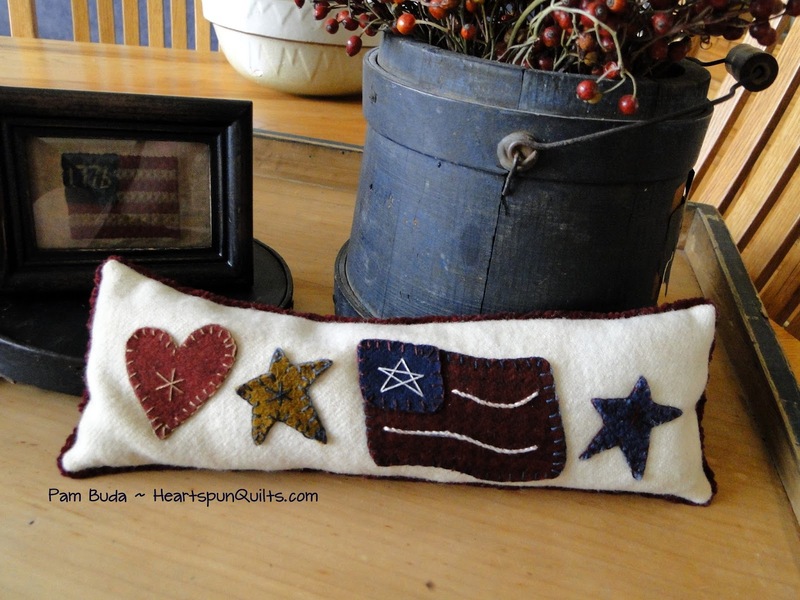 I have loads of Star Spangled Liberty scraps in need of a new home. Find a shady porch, grab an iced tea and some hand stitching. What a fine time that would be! Last Chance!! Tokens: Union Forever Special Offer!! 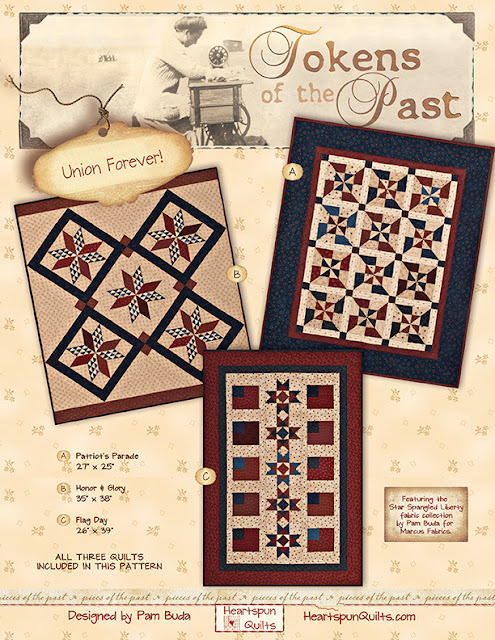 Just a quick reminder that my special pre-order pricing ends tomorrow on my newest Tokens of the Past: Union Forever quilt trio kit. My sincerest thanks to all of you whom already placed your order. You guys have blown me away with this one, and I'm so very grateful. Please know that your support allows me to keep creating fabrics and quilt patterns to enjoy and inspire, and I try never to take that for granted. I'm so very thankful to you all!!!!!!!!! My husband and I have been invited to join a big bunch of our friends to go cruising on Lake Michigan today on a friend's family boat. Something I haven't done in years, so we're excited. It is horribly hot and humid, so I hope I don't melt. Hope you enjoy your weekend, too. 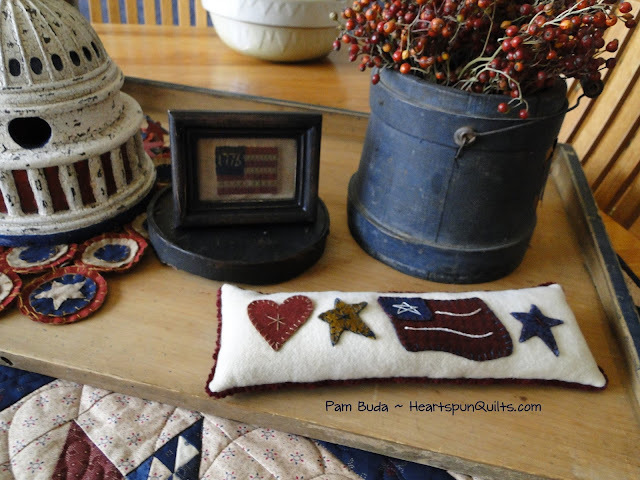 Since my post for our Buttermilk Basin Summer Blog Hop, I've received a couple dozen inquiries about the red chenille trim I added to my Americana Pinkeep. I promised to let everyone know how easy this really is. The hardest part of adding the chenille trim is finding the chenille trim. (I've solved that problem for you...read on!) The chenille comes in a soft ecru color and it takes the color in dye very, very well. I chose a color of Rit Dye (wine) I wanted, and mixed it up in a Ball jar with very hot water. (Follow the directions on the box/bottle.) Then, just drop in a length of chenille into the jar and let it sit in there a day or two. Check to see if the color is what you're looking for, and wearing gloves to protect your hands, rinse the trim, and hang to dry. That's it! I stitched the trim to my finished pinkeep by whip stitching (or couching it) over the seam. Use thread to match the color of the chenille trim and sew it down as you go. When you get to the ends, have them overlap about 1 inch or so. Easy, breezy! It adds just a little touch of something special to the whatever you're making. You can double the chenille to make it thicker if you have a larger project. You can twist it, too. Now...about finding the chenille trim. I bought mine from one of my all time favorite shops, Quilter's Station in Lee's Summit, MO. I called there today, and they still carry the chenille, and would be happy to send it you by mail. Or...if you're lucky enough to live nearby, definitely stop in. You won't be sorry you did....and it's a must see if you're traveling in Missouri!!! 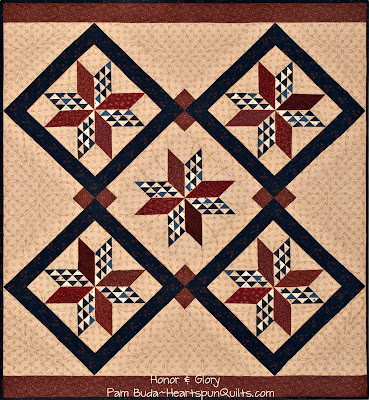 You can call the shop girls to order yours at Quilter's Station at 816/525-8955. The chenille is very reasonably priced. 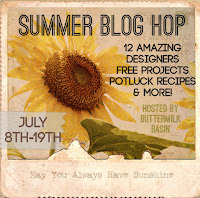 If you missed out on my Buttermilk Basin Summer Blog Hop day, no worries! Click here to get all the goodies you missed. 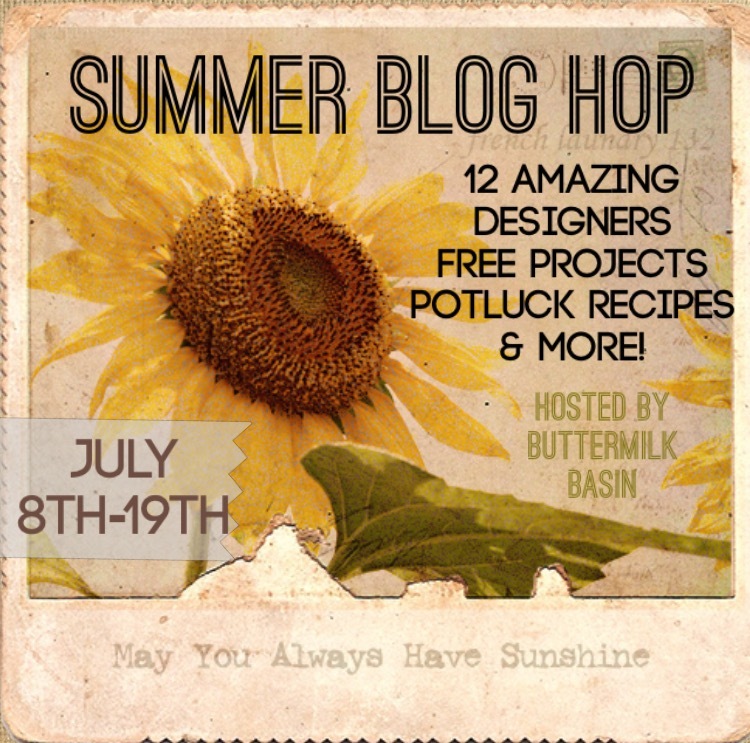 The blog hop is still going on, so be sure to check the Buttermilk Basin blog for the designer schedule. There's so many wonderful projects and recipes there just for you! There's just 7 days left to take advantage of my special price offer for my brand new Tokens of the Past: Union Forever! quilt trio. This has been a very hot item (thank you, everyone!!!) 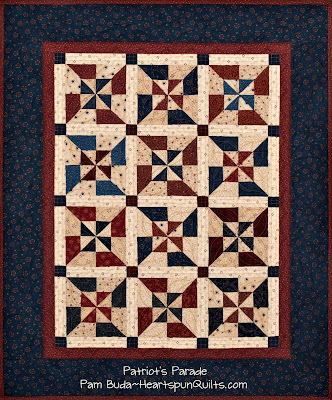 and is only available by pre-order....if you've been thinking about ordering this quilt kit, there are just days left to do so. Click here to read all the details. Labels: Buttermilk Basin, Tokens of the Past Union Forever! Welcome to our Summer Blog Hop! Welcome to my day on the Buttermilk Basin Summer Blog Hop! Summer is in full swing here and I'm doing my best to enjoy every lovely day. We've had a run of warm and comfy days here where the weather is perfect and being outside is wonderful. The house is still decorated in all things Americana, and I've been in this patriotic mode for awhile. I'm sure it has everything to do with my new patriotic fabric line, called Star Spangled Liberty (Marcus Fabrics), about to hit your local quilt shops next month. Do I have a Green Thumb? Well...I can grow things outside the house but have no luck growing plants and flowers inside. I'm OK with that. Average Temp Where I Live: Here in the suburbs of Chicago, we average temps in the high 80's to 90's with some humid, sultry days getting into the 100's. I'm not a fan of the hot, humid days and look forward to the cooler days of fall. How Do I Stay Cool During The Summer? Staying indoor with the A/C. We used to have a pool, but no longer. I try to enjoy the cooler mornings. Favorite Summer Drink: Iced Tea (year round favorite), frozen peach slushes and strawberry martini's. What Did I Do For July 4th? Stayed home this year, had a BBQ, and enjoyed the mild weather outdoors. S'Mores: Well....I've only had one once and I don't care much for marshmallows. Am I the only person who doesn't enjoy S'Mores? Do I Frequent Farmer's Market: YES!! We are so blessed to have a truly excellent Farmer's Market about 10 minutes from home. You can see more about this below. Favorite Summer Fruit: Summer brings all of my favorites. I adore dark cherries and haven't met a berry I didn't love. Do I Enjoy Handwork Outside? Oh yes...outside, inside, in the car, on a plane. I enjoy hand stitching wherever I go. Favorite Summer Tradition: It's funny how our favorite summer traditions have changed over the years. They are so different now than when our kids were small. The one thing that remains over the years are cooking and dining outside to enjoy the weather because winter will be back before we know it! We frequent places with outdoor dining, and several places where we meet our friends to enjoy live music, drinks and good food. Every Sunday in Frankfort, IL, which is the next suburb over from where I live, they hold a spectacular Farmer's Market. The village of Frankfort has a town square, village green, loads of artisan gift and antique shops and lots of wonderful restaurants. (On Thurday evenings, they also have a terrific Cruise Night where my hubby goes to show his collection of vintage cars and hang out with friends.) We try hard to attend the Farmer's Market every Sunday, weather permitting. They always have live entertainment. We bring lawn chairs, a small cooler and choose a shady spot to enjoy the music and people watching. Loads of people, old and young, families with little ones, and dogs all come for the fun. Of course, we all come for the food and special items by local farmers and artisans. The variety of offerings is quite amazing. Our absolute favorite booth is Stamper Cheeses. They're a local family whom make their own over-the-moon delish artisan cheeses and offer samplings of everything. Smart move as they often sell out early in the day which is why we make it our first stop. We enjoy so many of their creations with the Almond Apricot Gouda and Raspberry Asiago being our favorites. This Farmer's Market is such a gem in our community and it's absolutely free. What is not to love? The Potluck recipe I want to share with you is a big, big hit whether I take it to a Potluck, or just make it for us at home. It's easy, has just a few ingredients, and is absolutely delicious! Ice Cream Jell-O has been in our family since my kids were young and a neighbor brought it to a block party one year. It's something cool, light and fruity when you're serving heavy things like BBQ chicken or ribs, bratwurst and smoked brisket. It's so, so good, we often have a little as a dessert! Are you groaning over another Jell-O recipe? TRUST ME, this is not your ordinary Jell-O recipe and is quite DIVINE! There's nothing hard about making it. Like all layered Jell-O recipes, it just takes time and is totally worth it. You can substitute any flavors of Jell-O you like, but lime, lemon, peach and black cherry are the standard flavors the recipe calls for, and we love them just the way they are. Click here for a downloadable/printable copy of Ice Cream Jell-O. 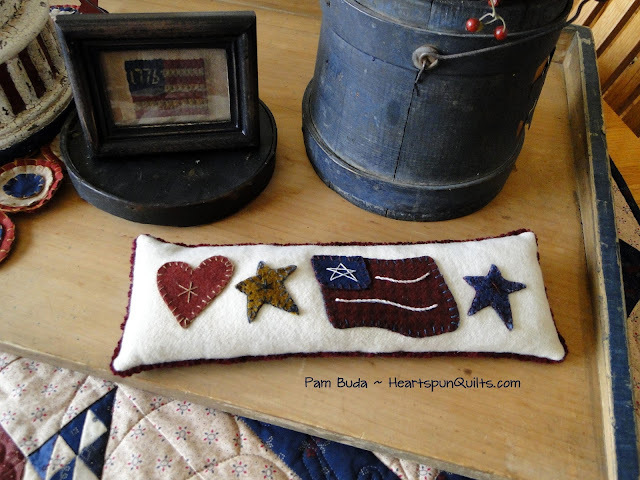 In keeping with my Americana theme this month, I was inspired to design this little Americana Pinkeep for your stitching pleasure. Just the perfect, small stitching project to bring to your porch or patio and whip up. You'll have the remainder of the summer to enjoy it! 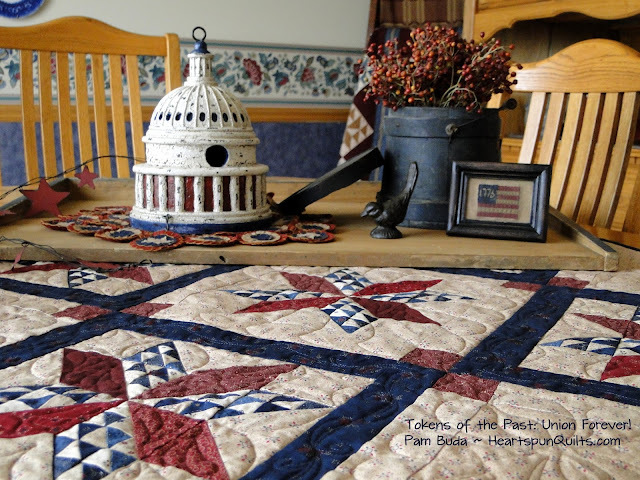 Click here to download/print my Americana Pinkeep pattern. 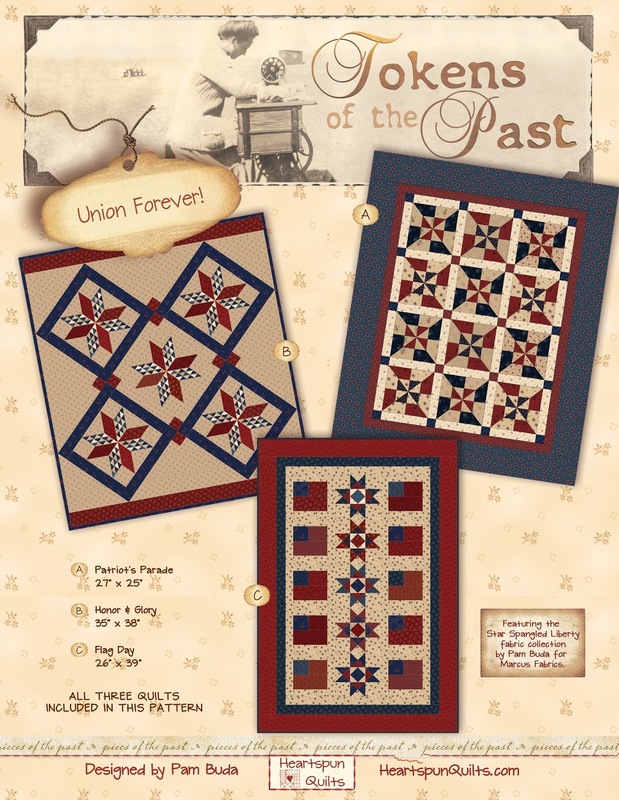 If you love making patriotic quilts, be sure to visit my blog for a limited-time special offer on my new Tokens of the Past: Union Forever! quilt trio. My thanks to Stacy West of Buttermilk Basin for once again hosting this oh-so-fun Summer Blog Hop. Hey, it's so very nice outside, I'm gathering something fun to stitch, a strawberry martini, some cherries, and a slice of Raspberry Asiago cheese. See you on the deck! Summer Blog Hop Begins Today!! The hopping fun begins today as Stacy West of Buttermilk Basin invited 12 designers to participate in another of her super popular blog hops. She's added two more to make a total of 14!! Beginning today, hop on over to each designer's blog to see what FREE project and summer recipe is in store for you. What's not to L*O*V*E about this event, right? Designer Cheri Payne of Designs by Cheri kicks things off today. Click here to see her posts and free summer design. You can also see the entire line-up of participating designers there, too. Be sure to come back here to my blog on Monday, July 11th for my project and recipe. Lots of goodies in store to inspire you and keep your sewing needles humming. The Fourth of July is one of my all time favorite times of year for decorating. Bringing out all my folk art finds is like seeing an old friend and having a visit. 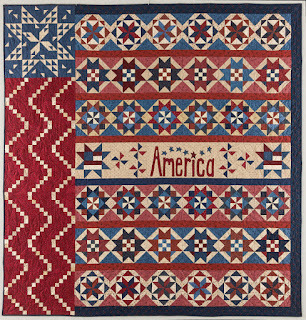 It was even more fun this year with the new quilts from my Star Spangled Liberty fabric collection! Thought I would share some pictures of how I displayed the new quilts in my house. I always love seeing how other people display their quilts as I get some good ideas, and perhaps you'd like something you see here, too. The quilt above is Flag Day. Patriot's Parade ~ Tokens of the Past: Union Forever! Here's the Patriot's Parade quilt displayed with a sweet little pie safe I found on a recent antiquing trip. It's super old, has original blue paint and dove tailing. A lucky find to be sure. Such a simple little block with lots of movement and patriotic heart. Honor & Glory ~ Tokens of the Past: Union Forever! 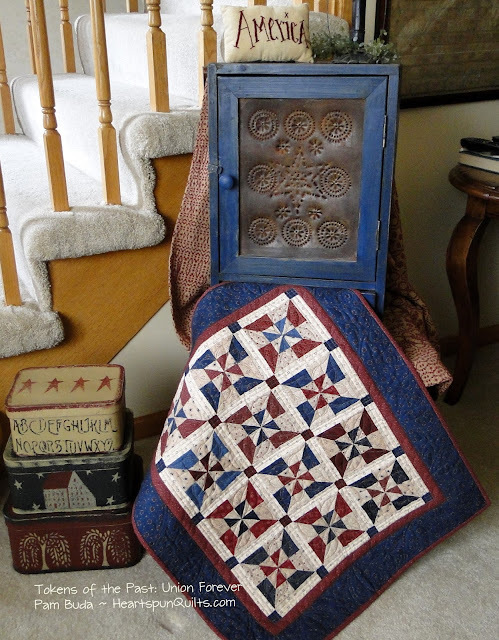 I love table topper quilts in a small vignette. Something about having textiles in the mix gives color and warmth, and often sets a theme. 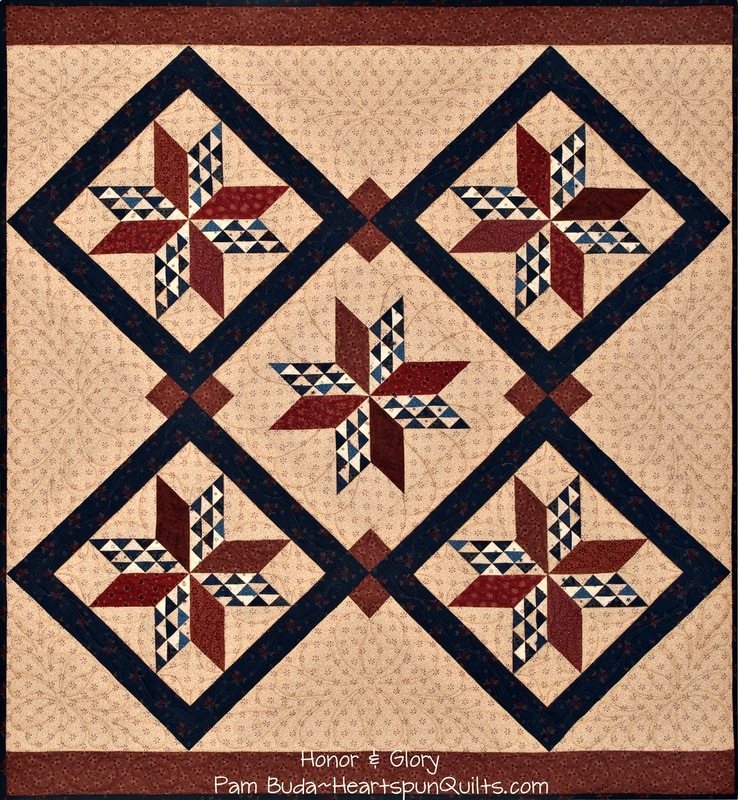 This quilt is called Honor & Glory and gosh do I love this block. I adore the Capital Dome birdhouse, and looks great with my vintage noodle board and firkin. Makes me wanna pass through the dining room often! Don't forget that I have a special offer to pre-order a kit to make all of these quilts for your very own. Click here to find all the details. Summer is in full bloom. Hope you get some stitching time for yourself. A rocking chair on a shady front porch sounds heavenly. Wish I had one! Our favorite summer holiday is almost here! July 4th celebrations are planned, Old Glory is proudly displayed, and a big swell of patriotism fills our hearts with pride! Americana is everywhere! To celebrate the upcoming release of my newest fabric collection, Star Spangled Liberty, I am offering this pre-order special for a limited time only. 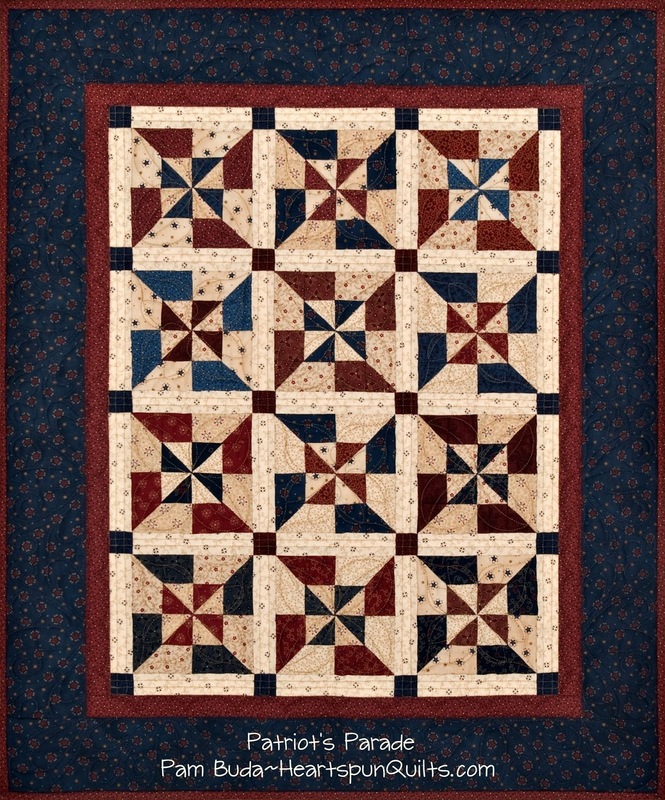 Make all three quilts in my Tokens of the Past: Union Forever! 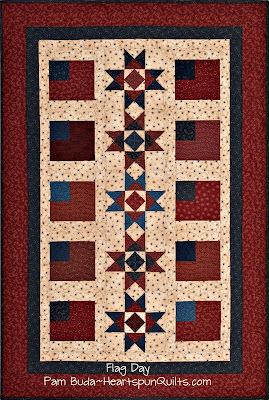 pattern by pre-ordering a kit that includes: the background, sashing, borders and binding, along with a 10 inch precut that has 40 fabrics all from the Star Spangled Liberty collection. And guess what? The Union Forever pattern is FREE!! Place your order no later than July 24th to take advantage of this special offer. SHIPPING WITHIN THE U.S. is FREE too!!!! The Star Spangled Liberty fabric will ship from Marcus in August, and we'll cut and package your kit, and have it on its way to you as soon as we can. Click here to read all the details about the Union Forever! 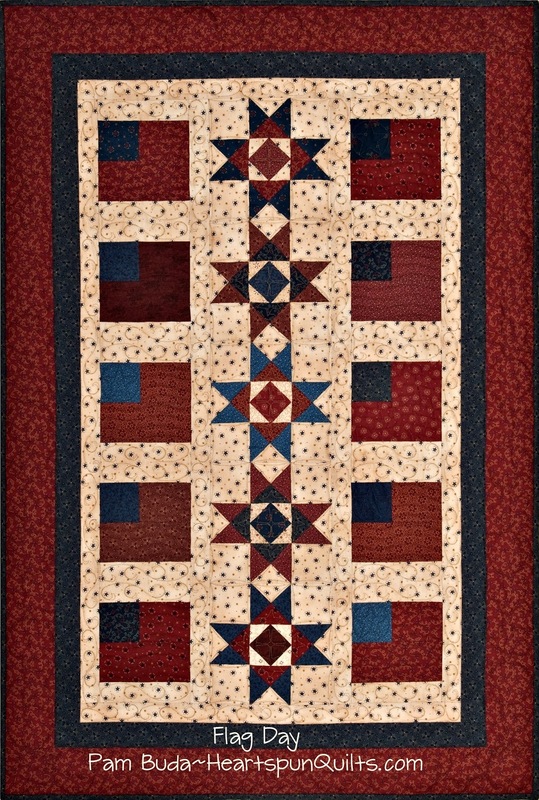 quilts, the kit, and place your kit order! Click here to order the Tokens of the Past: Union Forever! pattern. 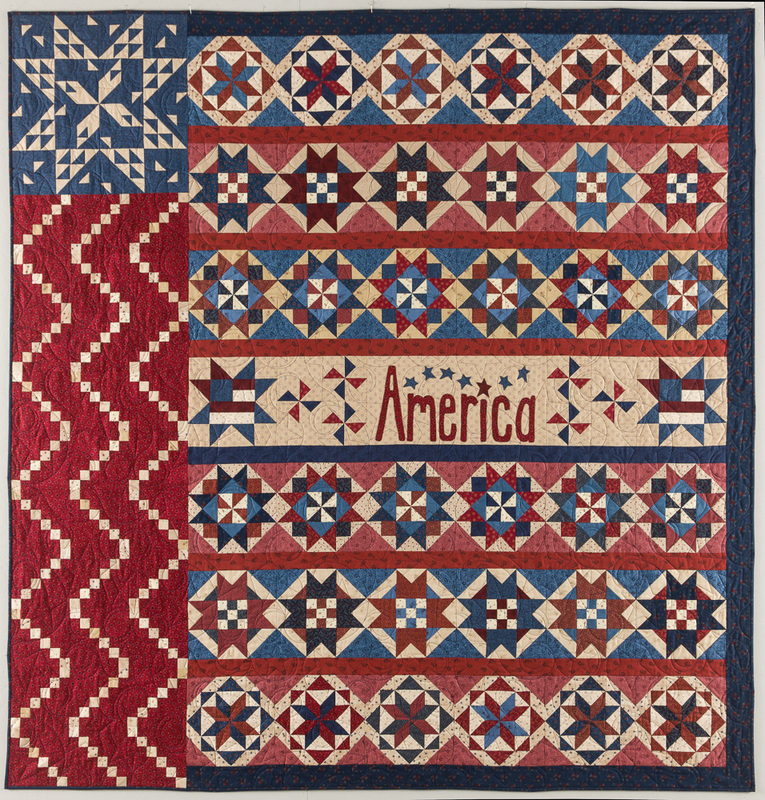 Click here to see all of the Star Spangled Liberty fabrics.